Inaugurated in 1983, the Civic Orchestra of Victoria is a volunteer organization dedicated to providing an opportunity for musicians of varying ages and abilities to perform a wide repertoire of orchestral music for supportive audiences in the Victoria and region. 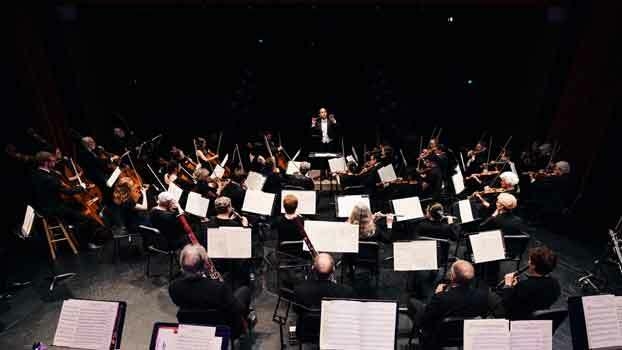 The orchestra serves as a platform for aspiring soloists and for choral groups, both as a learning experience and for the enjoyment of its members. The Civic also provides a service to sponsoring organizations in the community. The Civic Orchestra rehearses mainly on Thursday evenings at 7:00 p.m., at Centennial United Church, Gorge Road at David, Victoria. The orchestra's first director was Charles Barber, who left in 1985 to pursue his music studies in California. He was followed by the late Stuart Knussen, whose professional knowledge and ability enabled the Civic's standard of performance to reach new levels. In 1988, Robert Cooper took over the baton, and for the next seven seasons his energetic and innovative leadership opened new horizons, including several joint international “Opera Concerts” with the San Juan Singers from Friday Harbour, WA. In 1990, the orchestra was honoured to play a joint concert with the visiting Morioka Orchestra from Japan. Also, in 1994, the Civic Orchestra presented a “Commonwealth Celebration Concert” as part of the events leading up to the Commonwealth Games held in Victoria. Several gifted directors followed Robert Cooper's retirement as music director in 1995, culminating in the two-year appointment of János Sándor, a highly regarded conductor both overseas and in North America, as music director in 1996. Jean-Marie Kent was named associate conductor. The Civic Orchestra welcomed the distinguished musician and conductor George Corwin as music director in 1999, a year in which several guest conductors occupied the podium, including Yariv Aloni and a return visit by Robert Cooper. After 10 years on the podium Dr. Corwin stepped down and the orchestra welcomed a new conductor: Giuseppe (Joey) Pietraroia for a year. During the 2011-2016 seasons we enjoyed the varied styles and ideas of several guest conductors, while continuing to search for a new full-time music director. Brian Wismath took over the baton as music director for the 34th season, with Yariv Aloni as principal guest conductor. Each of the seasons under George Corwin's direction were planned around a theme. We had "A Tale of Four Cities: St. Petersburg, New York, Budapest and Hamburg". There was also "Civic Spreads Its Wings" in which we joined forces with the Malaspina Choir and performed in Nanaimo as well as in Victoria. Charles Job was guest conductor for one concert of the series. The Civic Orchestra of Victoria's annual “Sing-Along Messiah” was re-established under George Corwin's direction — a very successful event, awaited with much anticipation every December since and now a tradition in the community. It is the only Messiah of its kind in Victoria — the audience is the choir, although non-singers are also welcome to attend. Several guest conductors have led this event in recent years, including Hilary Coupland and Peter Butterfield. The Civic Orchestra of Victoria celebrated its 25th anniversary in the 2008/2009 season. Works performed included favourites conducted by three previous Civic Orchestra conductors. We also welcomed back Charles Barber, founder of The Civic Orchestra of Victoria, who directed the May 2009 concert. A complete list of works performed through the years may be found on the Archives page of this website. The orchestra is pleased to welcome an influx of new, younger musicians who bring a new energy to the organization. The Orchestra is funded through member subscriptions, donations from the community, and grants from various organizations. Tax receipts are provided for donations. The Orchestra welcomes volunteer support from individuals and businesses in the Greater Victoria region. For more information please contact the Orchestra Manager at the address on the Contact Us page. Volunteers are always welcome. Anyone with experience in managing not-for-profit organizations or with fund-raising experience would be particularly appreciated.